The warm gentle rays wake you as the sun peeks above the Sandia Mountains. You look through your window and see a beautiful sunrise, crawl out of bed and start the tea kettle. You don’t want to use your fuel today for lunch or dinner, so why not let the sun feed you? 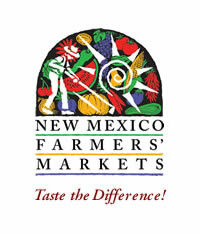 Albuquerque is sunny about 278 days out of the year! This means you could potentially make 278 solar meals annually, as New Mexico has the second highest solar potential in the country. Solar ovens are a great way to have the sun cook a meal while you’re at school or work. You save time, money, and help out the environment by not using gas or electricity. 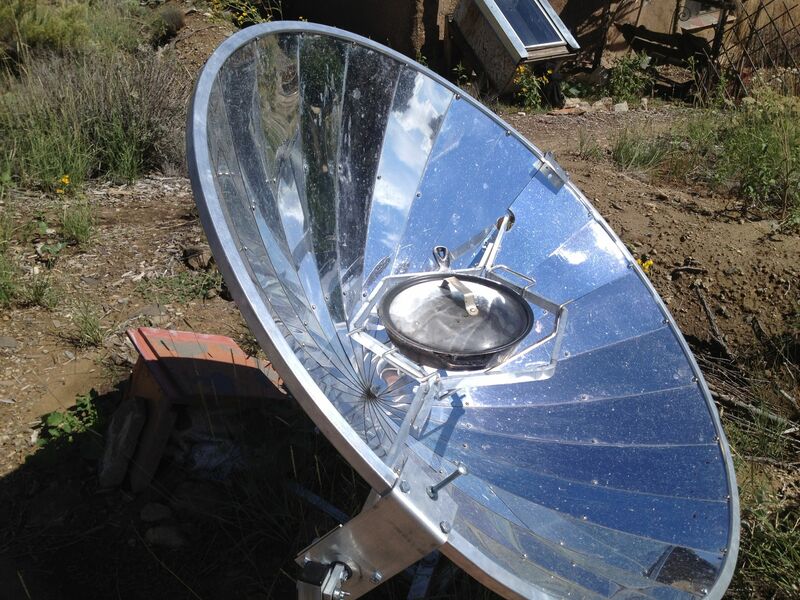 Solar ovens, also called solar cookers, come in a variety of shapes, sizes, and materials. The three most popular solar cooking devices are the parabolic cooker, the box cooker, and the panel cooker. These cookers are extremely powerful and can get as hot as 400 degrees Fahrenheit due to the reflector. This means you can fry foods and cook something faster than in a box or panel cooker. The only downside is that the parabolic cookers are not automated; you have to be around in order to move the oven toward the sun and make sure nothing is burning. Decent parabolic cookers made in the US are priced from $100 to about $350. This guy made his own parabolic cooker! This solar oven is comparable to a kitchen oven. It is an insulated box made to collect and trap heat, and can reach about 300 degrees Fahrenheit. The great thing about box cookers is that you can cook something while at school or work! There are many designs for box cookers. You can buy them, but it is much more affordable to build them out of salvaged materials. The Solar Wall Oven Plans originally designed by Barbara Kerr, and provided by The Ampersand Sustainable Learning Center, are the best plans for a long lasting box cooker. Panel cookers are the cheapest and most portable cooker. They can be made with simple materials and you don’t need handsaws or cut glass! This cooker can get to about 250 degrees Fahrenheit. Fancy panel cookers can cost about $150, but there are several cheap designs you can make with aluminum foil and cardboard or even windshield car shades. The Ampersand Sustainable Learning Center in Cerrillos, NM, is home to Amanda and Andy Bramble, two amazing, hard working people with enormous hearts, a love for ecological systems and cats. They have 15 years of experience with solar cooking and use the sun almost everyday to cook their meals. In the past I have baked peach kuchen in their solar wall oven and parabolic cooker and have decided it is now time for me to build my own solar cooking structure. The solar funnel cooker is a very simple design; these guidelines give you all the information you need. 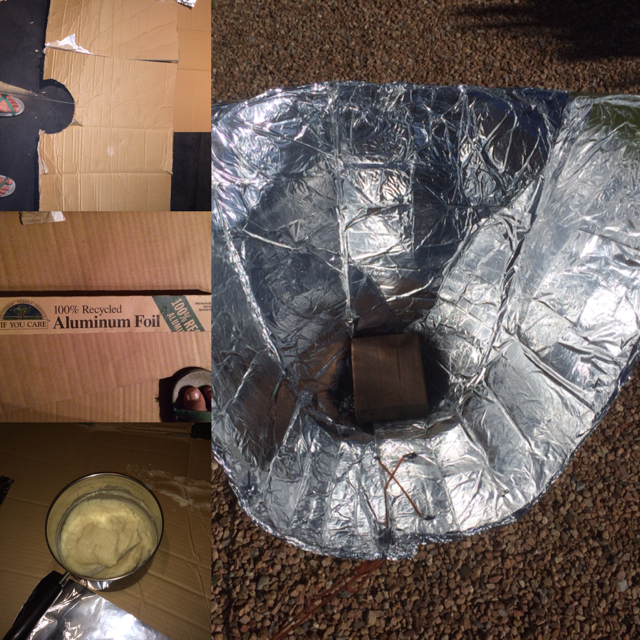 What I used for my solar funnel cooker was a box that was roughly 2 feet by 4 feet when flattened, recycled aluminum foil, wheat paste, yarn, and a small wooden square for insulation. 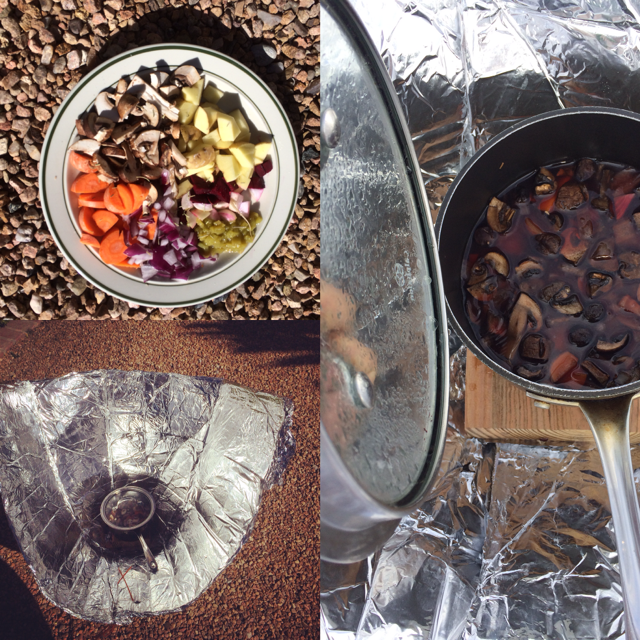 Amanda Bramble’s blog is filled with wonderful DIY information; one of my favorites is her post about solar stew. I was so inspired by this that I decided to try to make my own solar vegetable stew, so I ran to La Montañita Co-op to get the ingredients. All the ingredients are set into a small cooking pot and into the center of the funnel oven at around 9:30 AM. When I checked on it again at noon, the pot was very hot to the touch and the stew was steaming. 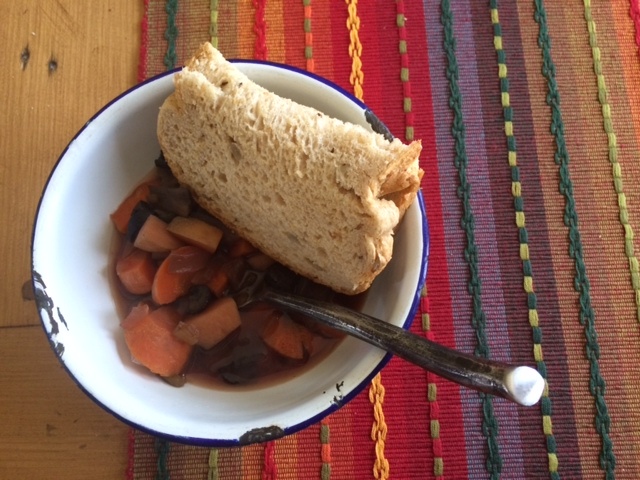 At 3:00 PM the stew was ready! Yum! There’s a really strong broth that is produced from the slow cooking. The stew would have been ready much faster if the cooking pot was completely black and covered by an oven bag. But, the reason I did not do either was because I wanted to use materials that were on hand, instead of going to the store and purchasing them. All in all it was a great first time solo solar cooking experience! Please get outside and let the sun feed you! Additional resources so you can make your own solar cooker! –This website has plans for a variety of cookers that can be made without breaking the bank! – I did not mention this tire oven but it’s worth a try!